However app and device installation instructions should be followed from this notice vs. the wiki. NST Remote Diagnostics - Used if you want to enable Remote diagnostics if requesting assistance, this provides a web page you can share for someone to assist you. Also in the driver section is a modified weather driver if you choose to use automations that require local weather conditions. This is based off of the APIXU driver written by @bangali but reduced in number of events and adding features required by the automations. The automations should work with other weather devices, however these devices may not offer dew point information to the automations, and NST Graphs application will not plot the weather data graphs or show forecasts, moon phases, etc. This device is installed and configured by you - ie add this driver under "Drivers Code", then under "Devices" create a new device "Add Virtual Device", and select "ApiXU Weather Driver Min". A reboot of the hub before installation (or after removing other apps/devices) is a good practice, and allow the db to settle for few minutes. Enable OAUTH when installing NST Manager app. After you paste the code but before you save, hit the "Oauth" button in the top (near save), enable it, then "Save"
you need to always install the NST EventStream + whatever drivers for your Nest Devices. Under "Apps" select "Add User App" and choose "NST Manager"
Under "Apps", select "NST Manager" and configure your Nest Access, choose devices to present in HE, and hit "Done"
It is important in NST Manager or automations when making changes, to "Done" your way out of the app so that the settings are properly applied. 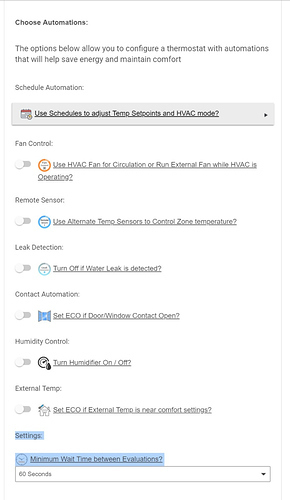 When you make settings changes, they can take a minute or so to complete configuration depending on the changes made, so after exiting with changes via "Done", wait a minute or two before making further changes of NST Manager or automation settings. NST Manager for Hubitat. Contribute to tonesto7/nst-manager-he development by creating an account on GitHub. This app allows you to use your own developer clientID and secret if you have one and wish to use your own. The Wiki NST Manager - Things That Are Smart Wiki has information on creating or editing your own nest developer account. The change for HE in these instruction is to use https://cloud.hubitat.com/api/nest as the callback URL (or additional callback URL). The site developers.nest.com will let you login with your primary Nest account credentials, fill in developer name, contact, and accept terms, and then create an oauth client. It is always a good idea to take a backup of your hub prior to installation and save this on your computer. For those running NestIntegration, this app and drivers can be installed "side by side". This is a good thing to do initially while you test out this new application. As stated in other forum notes, if you uninstall NestIntegration, you will not be able to re-install it since it has been removed. You likely do not want to run both applications "side by side" for an extended period of time due to loading on your HE hub. "Logs" in your hubitat can help you monitor NST Manager and automations. You can optionally "Enable Diagnostic Web Page" in NST Manager to provide a web URL for sharing data (this URL should not be posted in the forum or other public areas - it should only be shared via private message with those you trust). This feature requires the NST Remote Diagnostics App be installed on your hub. We suggest you do NOT enable "Enable Log Collection" unless specifically asked to as it raises the load on your Hubitat hub. Lessons learned - what would you do differently if you were to start from scratch? Getting "Oauth Not Enabled for Nst Manager" did I miss something in the directions? Try enabling oauth at the top of the app driver code page? I'm having this same issue. If I continue to hit next/done to finish setting up the app, then go back in, it finds the device. The problem I'm running into, though, is it doesn't seem to actually be creating the thermostat device. Please be sure the devices are installed along with the app. In a private message you can share "Logs", I can take a look. 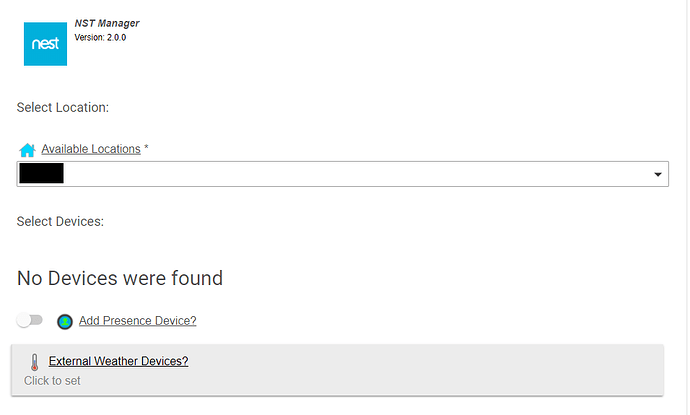 If by devices you mean the device drivers, then yes they are definitely installed. 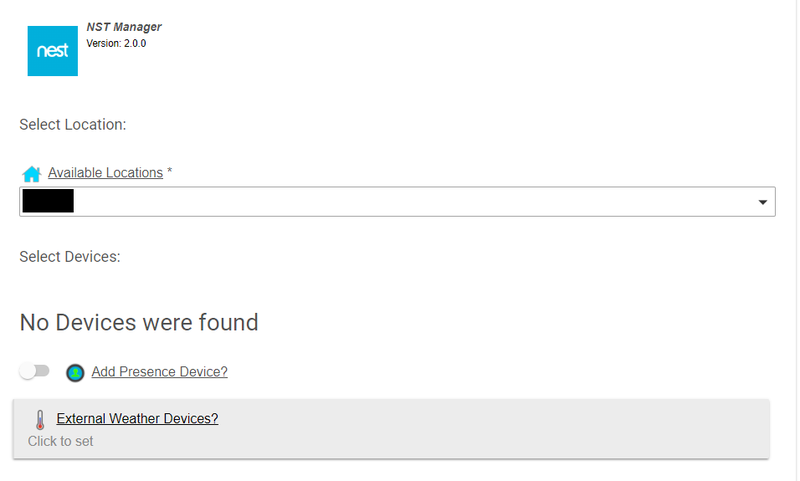 The devices themselves are not installed which is the issue. Thanks for the tip, that worked however like you it did not create the devices. The logs stated that a device with the same name already exists, so I think I need to remove my devices from the built in app before I can set them up with this one. I noticed that same error in the logs. I think this has to have something to do with why the device(s) aren't being created. Did you have to set Oath enabled for the nst-manager app in the app code page? Sorry for the trouble. I'm glad you figured it out. First look at this those are not errors, just that the name of the automation has not been set (the null is trying to print out the name). It would be good if you show some of the errors either in logs or screen shots. 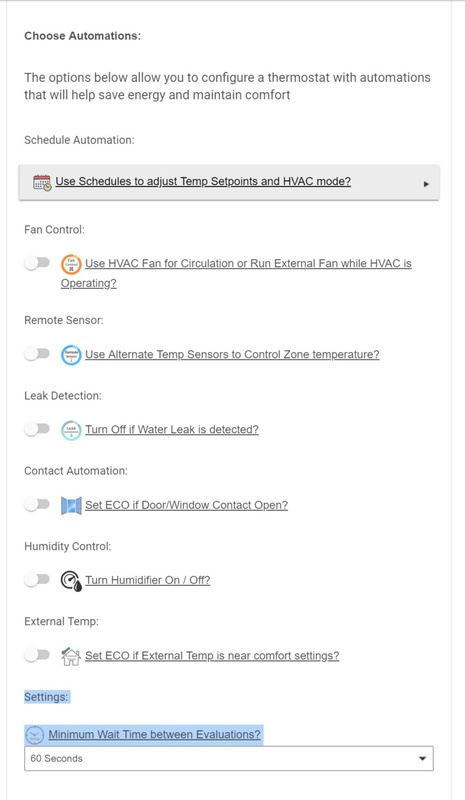 When I try to create the automation (thermostat) after all settings are made I select done and then the "done" option goes away but the page remains. No errors, but I can't progress, only option is to back out or delete. Edit, should be somewhere that you must add https://cloud.hubitat.com/api/nest to client in nest developer. Edit: Doh, I saw how, now the app changed after a few minutes.